India retained the Border-Gavaskar trophy with a sublime 137-run triumph at Melbourne on Sunday. After rain forced early lunch, India just needed a few overs to wrap up things on the final day. 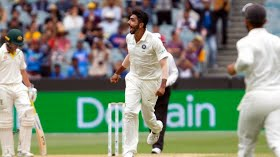 Jasprit Bumrah was named man of match for claiming nine wickets in the Test and setting up the impressive win. Speaking after winning the award, Bumrah said to play Test cricket is a great feeling. “Be it Boxing Day or any other day. I made my India debut in Australia, so great feeling. I always focus on consistency. When you have so many options, you may get confused. Someday you get wickets, someday another mate will, but we don't think about those. Bowled a lot, but I don't mind, because this is why we train. We bowl a lot in Ranji-Trophy cricket, and it pays off. When I made my ODI debut, I always just wanted to play Test cricket,” Bumrah said at the post-match presentation. An elated Indian skipper Virat Kohli said that the win has given them more confidence to play positive cricket in Sydney. "We are not going to stop here. This has given us more confidence to play more positive cricket in Sydney. We've done well in all three departments, which is why we've retained the trophy. But we want to continue. This is how we played in South Africa too, and we're not ready for the final game,” Kohli said post the victory. On not enforcing the follow-on, Kohli said he knew batting would be difficult on day four and five. “We knew that it would be tough for Australia, but credit to our bowlers, especially Jasprit. The three fast bowlers have broken the record for most wickets by pacers in a calendar year for a team, which is brilliant. I certainly feel proud as a captain when they bowl in partnerships. No one is looking to out-bowl each other,” the Indian skipper went on to say in praise of his bowlers.